Chris Lauber knows how to direct a great race, and the October 1 Ft. Desoto 15k was no exception. It was everything a race should be – great location, lots of port-a-lets, started promptly, great volunteers and well-staffed water tables along the course, race announcers, award announcers, beautiful medals, race photographers, musician for entertainment, free beer and pasta after the race. ***It really does not get any better than this. For this reason, I do almost all of Chris’ races! Had a GREAT time!! !.…thank you so much again…what a great race!!! Thanks for a well-run event. This was my first and I enjoyed it very much. At 65 I just walked the 5k, but it gave me the motivation to try another event. Thanks much. Another great race! No surprise to us. Good organization, good weather, good food and very spirited. Nicely done by you and the volunteers, and we will continue to support your efforts in promoting health, fitness and fun through your events. Please know that we appreciate your hard work, and that of the volunteers, in making the day a safe and enjoyable one. We look forward to the remaining races of the series. A great day! Thanks. That was a great race! Great course and fun atmosphere. This was one of the most organized races I have ever participated in. From all of the pre-race updates, to the race, to the post-race activities, everything was top notch. Thank you for a great experience. Just a short note to say how much I enjoyed the run yesterday. It was my first half, and at first, I was feeling badly about my time. Then when I saw how many fewer people there are as the age groups reach my age and older, I realized I have nothing to feel badly about. The goal truly was to finish. There are so many who can never start. Thanks for all your hard work. I always try to spare enough air to say “thank you” to the volunteers I see along the way. Without them, none of this would be possible. Thanks a million again! Congratulations on a great inaugural race! Loved your costume – you should have won the prize! I managed to get 11 Bradenton Runners Club members to do the race plus a friend from Sarasota ( she won 2nd grand masters) who is going to join our club. The only males in the 65-69 and over 70 were BRC members. Nice job with the race on Saturday and it was really great work as usual! I’ll be signing up for the Dec 13th race and will see you there. Thank you. Not sure if the outcome matched your expectations, but I think that was a great inaugural event. I hope it becomes a tradition! Thank you for putting on such a great event. I am on vacation from the UK and have run many races there – this one was up with the best I have done. Many thanks. Let me start by saying that the race was great! I really enjoyed the course. I see that I won my age group (60 to 64 Female, F61). I have 4 finish medals, and this makes 4 awards medals. Thanks in advance. Great race over the weekend. Can’t wait to see the pictures. Thanks. This was very well organized. Your follow up is incredible, all to make sure everyone has an opportunity to give feedback. I noticed you even go the extra mile to offer people an opportunity to get the right size t shirts, that is awesome and rare. Usually, I love the heat, but running 13.1 miles in a costume … uuugh did my worst time. I will be back to hopefully redeem myself in December. Thanks for all your hard work. Great job! Great race … wondering if you’re going to post any photos to the event website before the weekend. I was hoping to show some of our running group what they missed. Thanks. Thank you so much for a wonderful race. I’ve done the Holiday Halfathon the last 2 years and am signed up for it again this year, you do a great job. 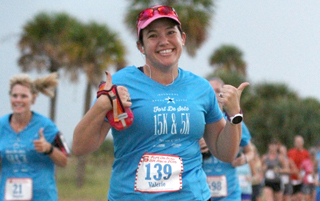 Ft. De Soto Park was a stunning venue for the race. There were a couple of glitches with the drink areas – at one of them, I had to stop and pour my own! However, that was a minor inconvenience compared to how well the race was organized generally. I liked the fact that costumes were encouraged – I think sometimes we take ourselves too seriously. I look forward to the January half-marathon as well as to participating in future Halloween Half-marathons.